Black Tap's Cotton Candy, Sweet and Salty and Cookie milkshakes are pictured here. Despite freezing temperatures in New York City, dessert lovers are waiting in lines up to two hours long just to get a taste of these "hella insane" milkshakes. The artfully-designed shakes, which are almost a foot tall, sell for $15 at Black Tap Craft Burgers & Beer, according to the the restaurant's head chef and owner, Joe Isidori. Black Tap first launched the milkshakes this past November, Isidori told ABC News. 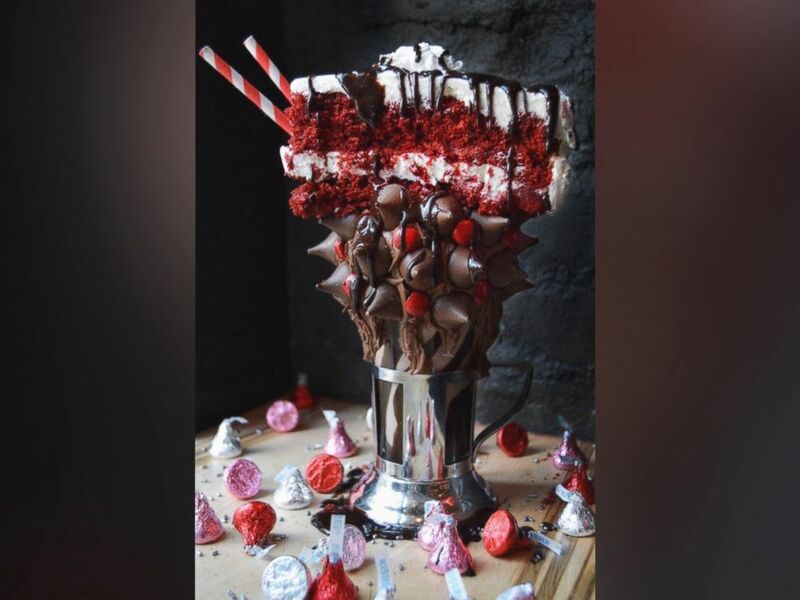 The shakes, which "look great and taste great," have since spread like wildfire on social media, where users have been snapping and sharing mouth-watering photos of the shakes, he said. Isidori credited his wife as the inspiration behind the colorful shakes. "One day my wife wanted me to make her a cotton candy milkshake, so I whipped something up, put it on Instagram and the rest is history," he said. Black Tap currently offers three main specialty milkshakes for $15 at its two Manhattan locations. Additionally, the restaurant sometimes offers limited-edition seasonal milkshakes for holidays and special events. Custom-made milkshakes are also available with advanced notice.
? ?SHAKE IT LIKE IT'S 1986 ? ?#LGM #METS #worldseries #baby #newyork #NYC #baseball #shake #desert #foodporn #foodie #1986 #blacktap #blacktapnyc #blacktapthat ?? Upcoming specials include the Red Velvet Milkshake for Valentine’s Day and the Super Bowl Milkshake for Super Bowl 50. Black Tap's limited-edition Red Velvet Milkshake will be available for Valentine's Day on Feb. 14, 2016. Black Tap also offers nine "regular" milkshakes for $7. Some of the most popular flavors are Oreo cookies and cream, vanilla and strawberry.